A Sept. 4 letter signed by more than 1,500 Catholic nuns, priests and other Church leaders from around the country addressed to U.S. senators voiced concerns about Judge Brett Kavanaugh, a fellow Catholic, as he faced confirmation hearings on Capitol Hill in early September that may result in a seat for him on the Supreme Court of the United States. The concerns of the signers focus on what they say is his past record on health care, immigration, labor rights, voting rights, and the death penalty. “As Catholics, we believe that any government official — including a Supreme Court Justice — must be concerned with the needs of people who are marginalized, not just the rich and powerful or a member of one’s own political party,” says the letter circulated by the Catholic social justice lobby Network. The letter expresses worry and asks what would happen to legislation such as the Affordable Care Act, cases involving immigration issues, voting and labor rights, as well as capital punishment, should Kavanaugh become a justice. Kavanaugh, a circuit judge of the U.S. Court of Appeals for the District of Columbia, has in the past ruled against workers’ right to unionize and his record on immigration is limited. He also was part of a three-judge panel that upheld a law that required voters in South Carolina to show photo identification before casting a ballot, an action that some say disenfranchised minority voters who were less likely to have ID. Will Judge Kavanaugh support the common good and defend against attacks on the health of the most vulnerable? Will Judge Kavanaugh uphold the dignity of all people and respect international human rights law? How does Judge Kavanaugh balance the rights of workers with the rights of employers to achieve the common good? Will Judge Kavanaugh uphold our faith and democratic principles of civic engagement, especially for marginalized communities? 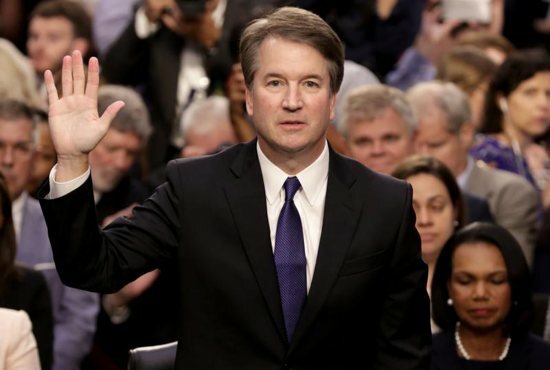 What is Judge Kavanaugh’s position on capital punishment and is it consistent with the common good? Republicans spent Sept. 5, the second day of Kavanaugh’s confirmation hearings, highlighting the nominee’s good works by asking him about his volunteer work at Catholic Charities in Washington. Kavanaugh spoke about serving meals to the poor and some of the conditions that led to homelessness for some of them, “mental illness, terrible family situation, maybe they lost a job and had no family,” he said. Kavanaugh also spoke of tutoring at Washington’s Jesuit Academy. Republicans hope to have the senate vote on his nomination by Sept. 20, days before the Supreme Court term begins again in October. The seat on the high court was left vacant when Justice Anthony Kennedy announced his retirement in late June.